It is with great sadness the family of Mona McCormick announce her passing which occurred at Kennebec Manor on Tuesday November 6, 2018. Born in Maces Bay, NB April of 1926, she was the daughter of the late John and Beulah (Belding) Corscadden. Mona was a loving wife, mother, grandmother, great grandmother, great-great grandmother and great- great- great grandmother, sister, aunt and friend. She enjoyed cooking, baking and sewing; her love of the Lord Savior guided her every day of her life. 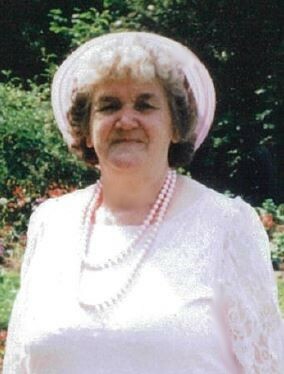 Mona was a faithful member of Full Gospel Assembly and enjoyed the music ministry with her harmonica in earlier years. Mona is survived by her children Irene Hackett, Jeanie Hannah (Don), Bernadine Hachey (Raymond), Paul Storey, Charlene Bastarache, Wayne Storey (Hope), Gary Storey, Wendell Storey (Bev), Brenda MacAulay (Jim) and Carl Storey; son-in-law Bruce Bastarache; sister Lyda Emery, brother Ray Corscadden (Shirley); sister-in-law’s, brothers-in-law; several grandchildren, great-grandchildren, great-great and great-great-great grandchildren; nieces, nephews and friends. Along with her parents, Mona was predeceased by her 1st husband Robert H. Storey, 2nd husband Willard McCormick; daughters Helen Edmunds, Rosie Munn and Marion Graves; sons Donnie Storey and Arthur Storey in infancy; seven of her siblings and daughter-in-law Mitzi Landry. The family would like to take this opportunity to thank the Doctors, Nurses and Staff of Kenebec Manor for the care and love shown to Mona over the past years. Your kindness and compassion will never be forgotten. Arrangements are under the direction of the Fundy Funeral Home, 230 Westmorland Road (646-2424) with visitation on Wednesday, November 14th from 1:00 p.m.- 2:00 p.m. Funeral service will begin at 2:00 p.m. from the Fundy Funeral Home Chapel. Interment to follow at Fernhill Cemetery. Donations in Mona’s memory can be made to Romero House, Outflow Ministries or to the charity of the donor’s choice.